Sama Commences 5th drill hole at Yepleu – Sama Resources Inc.
Montreal, Quebec – April 11, 2019 – Sama Resources Inc. (“Sama” or the “Company”) (TSX-V: SME | OTC.PK: SAMMF) is pleased to announce the commencement of the 5th deep drill hole (YE22-225440) at Yepleu and the 3rd at the Yepleu Sector 1 as a follow-up on the mineralized zone intersected in both previous deep drill holes (ref: press release of December 12, 2018 and April 4, 2019). Figure 1 (see below) illustrates the first two drill holes at Yepleu Sector 1, defined by Sama’s strategic partner HPX TechCo Inc (“HPX”) using the proprietary Typhoon™ electromagnetic geophysical (“Typhoon”) system. 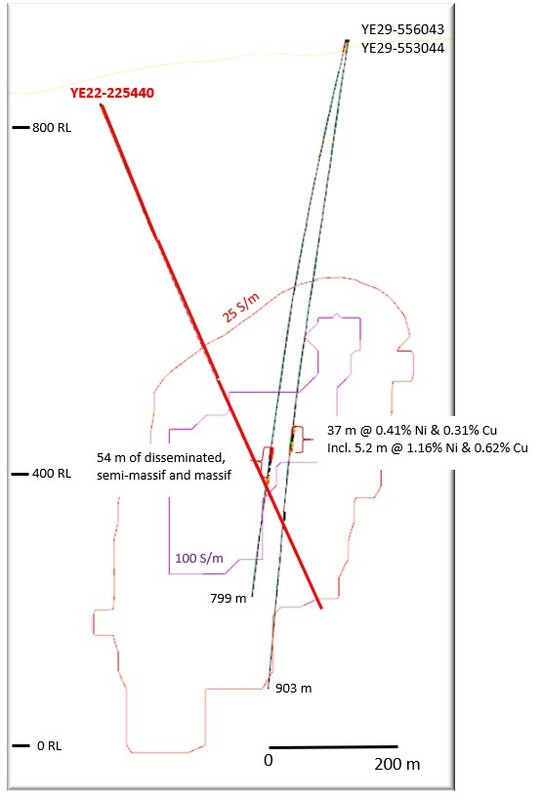 The current 6,000 meter (“m”) drilling program is designed to test high-conductivity targets delineated by the Phase 1 Typhoon survey at the 100%-owned Yepleu property at the Company’s Nickel-Copper-Cobalt-Palladium Project in Côte d’Ivoire, West Africa. “The 5th drill hole (YE22-225440) targets the center of the Yepleu Sector 1 geophysical anomaly. The results so far from drilling confirm the ability of the Typhoon to identify high conductivity targets. The mineralization that we’re beginning to unveil is proof that Typhoon precisely identifies quality targets.” stated Dr. Marc-Antoine Audet, President and CEO of Sama. The mineralization encountered in the two first holes drilled at Yepleu Sector 1 is characterized by aggregates of nickel, copper and iron sulphides pentlandite, chalcopyrite and pyrrhotite, respectively. Pentlandite occurs together with pyrrhotite, while the chalcopyrite is either mixed with the pentlandite and pyrrhotite or occurs as late millimetric to centimetric sulphide veins cross-cutting the pentlandite and pyrrhotite. The textures of the sulphide mineralisation vary from disseminated to semi-massive and massive (> 95% of sulphide material). The first drill hole (YE29-556043) intersected semi-massive sulfide mineralization with a combined 5.2 m intersection grading 1.16% nickel, 0.62% copper, 0.24 gram per ton (‘gpt”) palladium and 0.21 gpt platinum (using a cut-off-grade of 0.8% nickel) within a larger interval of 37 m of disseminated sulphide mineralisation grading 0.41% nickel, 0.31% copper, 0.23 gpt palladium and 0.17 gpt platinum. Assay results for the second hole are pending. 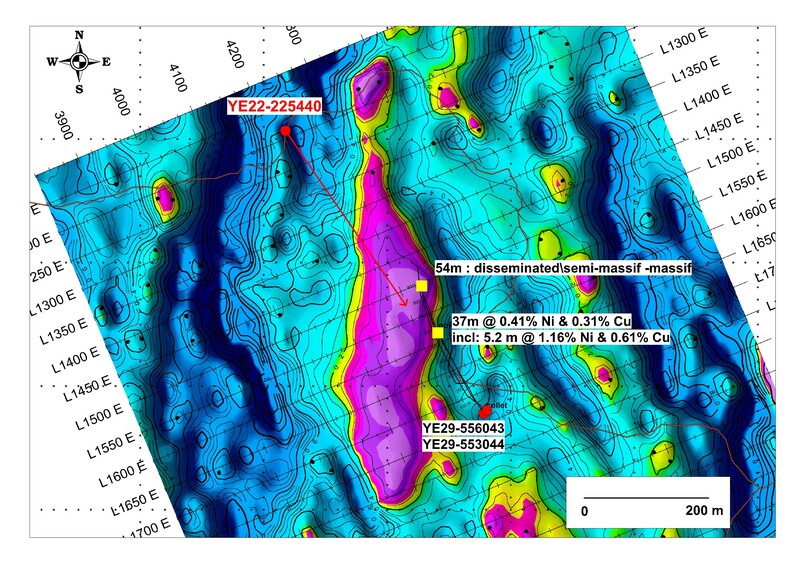 Figure 2: Surface mise-a-la-masse map at Yepleu Sector 1 prospect showing drill hole traces for the two holes drilled to date and for the current hole YE22-225440. Certain of the statements made and information contained herein are “forward-looking statements” or “forward-looking information” within the meaning of Canadian securities legislation. Forward-looking statements and forward-looking information such as “evidence”, “potential”, “appears”, “seems”, “suggest”, are subject to a variety of risks and uncertainties which could cause actual events or results to differ from those reflected in the forward-looking statements or forward-looking information, including, without limitation, the availability of financing for activities, risks and uncertainties relating to the interpretation of drill results and the estimation of mineral resources and reserves, the geology, grade and continuity of mineral deposits, the possibility that future exploration, development or mining results will not be consistent with the Company’s expectations, metal price fluctuations, environmental and regulatory requirements, availability of permits, escalating costs of remediation and mitigation, risk of title loss, the effects of accidents, equipment breakdowns, labour disputes or other unanticipated difficulties with or interruptions in exploration or development, the potential for delays in exploration or development activities, the inherent uncertainty of cost estimates and the potential for unexpected costs and expenses, commodity price fluctuations, currency fluctuations, expectations and beliefs of management and other risks and uncertainties.